The publisher says it is looking over what reviewers and the press said about the game, and taking notes for a possible sequel. Enslaved didn't sell quite as well as Namco Bandai might have hoped, but the publisher says that it's far from finished with the game. Namco Bandai's marketing director, Lee Kirton, says that the publisher is proud of how the game was received by critics, and is considering what to do with the IP going forward. Enslaved: Odyssey to the West - to give the game its full title - told the story of Trip and Monkey, who had to cross an America devastated by war and largely reclaimed by Mother Nature. Trip was trying to get home after she had escaped from slavers, and forced Monkey to tag along as her bodyguard by fitting him with a headband that made him obey her commands and would kill him if she died. Namco Bandai expected the game to sell roughly one million copies, but unfortunately, it fell short of that number by around 20%. 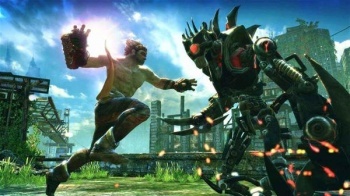 Kirton acknowledged that the game didn't meet Namco Bandai's sales expectations, but said that the publisher was pleased by the positive reception it had received from those who had played it. He said that Namco Bandai was looking at press feedback and reviews for a possible sequel, although he couldn't say how far along that process was. He added that the quality of the work done by developer Ninja Theory - who is now working on a new Devil May Cry game for Capcom - led Namco Bandai to believe that Enslaved would be a great catalogue title in the future. As someone who thoroughly enjoyed Enslaved, I'm rather pleased to hear that Namco Bandai isn't writing it off as a failure. I'd be more than happy to guide Monkey and Trip through another adventure, if just to watch the relationship between them develop, and hopefully Namco Bandai will be able to convince lots of other people to do the same.